Banish the January blues, slide into flip flops instead of shoes and prepare yourself for some spectacular views! It might be glum and gloomy back home, but sunshine and happiness are just a flight away. Whether that's long haul or slightly closer to home, you'll find a little inspiration in our where's hot in January guide. With the feel good factor of Christmas seeming like a distant memory, the opening month of the year can often be a struggle. So why not treat yourself to a Vitamin D boost and start the year in style? It might feel cold, damp and miserable back home, but January average temperatures sit at a balmy 21°C in Fuerteventura. Music to the ears of all you beach lovers, you'll soon be slipping into your swimwear and choosing from the 150km of white and golden sands. 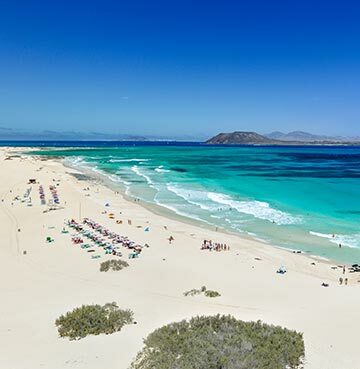 Corralejo is the pick of the bunch for many, sitting in the area's natural park that stretches along the coast for a whopping 10km. Home to undulating sand dunes and with views of the Isla de Lobos, this is a beach day like no other! You're spoilt for choice when it comes to amazing beaches here, Cofete is a whopping 20km long and tucked away behind the Jandia Mountains – ideal for tranquillity. Esquinzo is even more isolated, sitting six kilometres from the nearest town. La Concha is an idyllic blend of white sand and turquoise sea, while the El Cotillo Lagoons offer paradise in small doses – with a number of little beaches to choose from. Is the beach simply somewhere for you to dump your stuff and get out on the waves? If the answer is yes, you're in the right place! With its favourable position in the Atlantic Ocean, Fuerteventura benefits from strong winds that make watersports a breeze. Surfing, sailing, diving – they're all amazing on these shores. And with the winds a little calmer in the winter months, beginners will find it easier to hop on their board. Sea kayaking offers a more laid-back option, as you paddle at your own pace along the spectacular coastline. While snorkellers and divers can enter a world of warm waters and colourful marine life. Keep your eyes peeled for parrotfish, crabs, rays, seahorses and eels – if you've got an underwater camera, make sure it's in the case! Amazing cuisine must be an island thing, because just like St. Lucia there's a delicious menu to choose from on Fuerteventura! You'll find plenty of Canary classics like Mojo Picon sauced poured over the island's famous wrinkly potatoes and local meat that melts in the mouth. 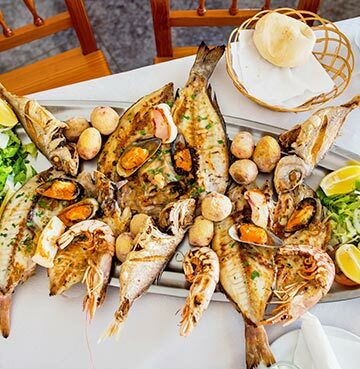 But what often comes as a surprise is just how much seafood you'll find in restaurants here! The catch of the day tastes deliciously fresh here and can be picked up at fish markets, if you fancy cooking for yourself. A little known fact about Fuerteventura is that it's home to more goats than people, which has led to the development of a famous cheese. Majorero is firm with a nutty taste, produced using the milk of its famous hooved residents. Head to a rural village and sample the real deal for yourself, picking up a homemade version crafted by locals. There's so much to do here that you're unlikely to get bored! And with your hire car, you'll love exploring the island and cramming in everything that appeals. The Ajuy Caves are another natural marvel, carved into the cliffs by sea winds and waves – there's also a charming village here to help you make a day of it. Long-standing monuments are perfect for history buffs, like the 17th century Torre del Toston that was built from local stone and used to defend against invading pirates. With a turtle sanctuary, zoo and natural park, there's plenty of animal encounters to be had too. 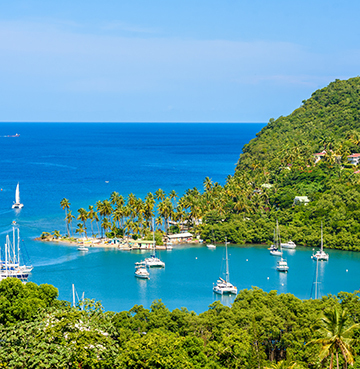 If you're looking for tropical paradise this January, look no further than St. Lucia. The Caribbean island that blends amazing natural beauty with year-long sunshine and a delicious cuisine. 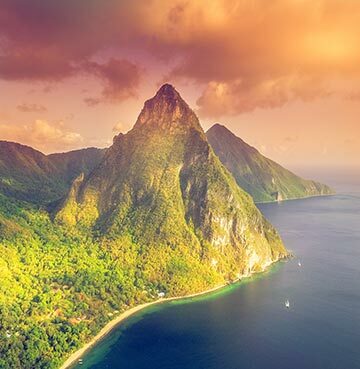 We'd be crazy not to kick off our island tour with the Pitons, the towering volcanic peaks and UNESCO World Heritage Site that sits above the rest of the island. Trek them, enjoy them as you lay back on a boat or stay put on the beach and admire them without moving a muscle. Well maybe a couple if you're sipping on a long drink! Don't let them mesmerise you for too long, we've got volcanoes and waterfalls to get to! Cascading falls are scattered all across the island, but the most sparkling of all has to be the Diamond Waterfall – the clue's all in the name. Sitting in the Diamond Botanical Gardens and its impressive flower-spotted estate. Not far from Soufriere, why not head for the nearby 'drive in' volcano once you're done taking a dip? You can drive right up to the bubbling crater here, a true once in a lifetime experience! And when you're finished admiring the bubbling lava, head down to the mud baths for nature's own spa day. Marigot Bay should be high up on your list too. This natural harbour features the most amazing shades of greens and blues, with a thick blanket of trees and towering palms sitting on golden sand. The long channel of mesmerising blue is the perfect foil, best seen on a boat trip that takes you right up into the inlet. Pigeon Island not only offers amazing beauty, it also plays an important part in St. Lucian past. In the 1500s French settler Jambe de Bois used this as a base for raiding Spanish ships, while under British rule in the 1700s it become a lookout point to monitor French ships coming from Martinique.